Long ago and far away, the great, great grandparents of pugs today lived in Buddhist temples high in the mountains of Tibet. On moonlit summer nights, the little pugs pressed their flat noses to white moon orchids, glowing like moths flying through a moonbeam. At dawn they lay by blue-green ponds where fat little toads leaped and splashed. The loving companions to the monks lived in harmony with everyone and everything around them. In the Buddhist tradition, The Little Pug’s Dreams illustrates the timeless value of mindfulness, compassion, and the awareness of the interconnectedness of all beings. 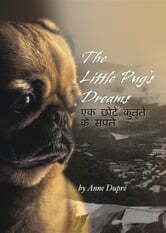 The Little Pug’s Dreams offers a delightful and enriching story for young readers and an inspirational narrative for all ages. Certainly the universal message of compassion and mindfulness to the beauty that surrounds us is more important today than ever.